He’s a barber by day, and fencer and rockstar by night. As a 2012 Hairstyling graduate from MC College Vernon, Brett’s passion for the industry started when he played in a band as a guitarist. Today, he is a co owner of The Gentlemen’s Shop and Shave Parlour and a men’s hair educator. Why did you decide to get into Hairstyling? There was no barber school around when I decided I wanted to do men's hair. I remember coming back from tour with the band and I asked my barber how I could go about it. He told me to go to school and get the fundamentals then apprentice for my barbering. Well the next day I enrolled in @mccollegegroup to start my journey. 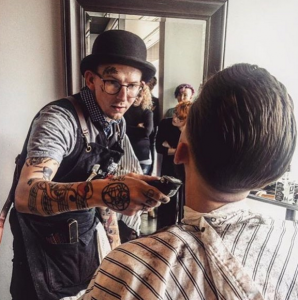 Some of the best uk barbers started out in hair school. I took the long way about it you could say but I have absolutely no regrets. I was fortunate enough to have the benefit of both teachings. I took so much out of hair school. Different cutting techniques, texturizing, razor work, short hair, long hair (even though I do very little now) and the most important thing was sectioning. Sectioning was drilled into us for the first 6 weeks in class then drilled for the course of the next year on the floor. I see new barbers come out of school who can't even section a proper line or even create a clean horse shoe parting. Styling and the use and importance of a blow dryer was also drilled and this is one of the most important things that we use in the shop. Now at times it was super hard and definitely frustrating. But I had a clear goal. I was there to further my education on men's hair. So no matter how hard up dos and finger waves were I knew I had a clear goal to get to. After school I went on to apprentice to learn straight razor shaving, more detailed scissor work and more clipper work. Well 6 1/2 years later the passion is still there more than ever and I am a proud owner of a barber shop. So to everyone in school remember your there to learn so learn and don't have an ego where you think you know more than the teacher after 3 months. Because 99.9% chances are you probably don't. Without all this and the great teachers I had I wouldn't be where I am. Since graduating, what would you say are your career highlights? Well everyone tomorrow is the big day! We can't thank everyone enough who is build our shop. From our wives who sanded all the walls and base boards to my father who really helped us not burn the place down. We have put our heart and souls into this little shop and we cannot wait to show you tomorrow. Feel free to pop in and say hi at any time. Our favourite quote is by @barberbrianburt saying "Built not bought!". We can honestly say we've have done 90% of the shop with just us and family! Cheers to and new adventure everyone! Since being in the industry, what’s the most important lesson you have learned? The taper Comb! One of the most important pieces in my arsenal. You'd be surprised how many classes that I've taught where no one in the class actually had one. The taper come is just as important to me as my regular cutting come is. It allows me to get to those fine details in my cuts. After I'm done all my clipper work and my scissor work and after the cut is all dried into style. I will re go over all the sides with my 6" hanzos and my taper come. Giving it that polished look. Allowing me to cut just as close as a .5 guard would. Do you have this Comb in your pocket? You should! Know your tools my friends! What do you see trending in your industry right now? I had such a blast with the class today! We have very little fore men's education here in the okanagan. Even on the west coast of Canada there is just not that many men's cutting classes that tend to happen. In the last 2 years I have been fortunate enough to be given the opportunity to start teaching and it just grows my passion for the industry that I love so much. So thank you to everyone who has taken my classes. And a huge thanks to the group today who came from all over! I truly appreciate it and I cannot wait until the next one! What a rad day that was. What’s the most important advice that you can offer MC College students who are looking to become successful in their own careers? “Listen! Listen to your teachers. Remember you’re taking school for a reason and that’s to learn. Don’t have that ‘I know everything’ attitude because if you did you wouldn’t be in school. Listen to your clients. A strong consultation is the key to ANY good haircut. Work on your consultation process to make sure you get all the details. Listen to yourself! We take this career because we are passionate people who love to work with our hands and we usually love to help others. This is an industry where we enjoy making others feel great about themselves. But if we start hitting a point where you yourself are not enjoying it then something might need a change. Not in what you’re doing but maybe in how you’re doing it, where you’re doing it or what your doing about it. Try hard and do your best. Have a goal to work towards. Already filling up! On March 26th I will be holding my first look and learn of the year at The Gentlemens Shop. I will be doing a 2 model demonstration showcasing 2 different looks. I will be going over the different types of tools I use, proper clipper maintenance, fading techniques, both scissor and razor texturizing techniques and shapes and sectioning in men's cuts. The class will be 50$ and it starts at 10 am. There will only be a limited spots available and it's already filling up quick. So DM me if you would like a spot! This was one of my favourite cuts from the summer! Clean sides but tons of texture on the ridge and up top. We razor cut the top leave disconnection from the sides to add extra texture and a heavier weight line. Leaving the frame more square! Blow dried with @layriteofficial matte cream and styled up with @layriteofficial cement! Tell us something that would surprise people about you! If you could makeover anyone, who would it be?